Across Five Aprils is the touching story of Jethro Creighton. When the Civil War breaks out, his family is split, with brothers joining both sides of the cause. When cousins also join the war, the two families join forces to keep the farm going. Jethro's father dies unexpectedly, and young Jethro is now the man of the family. With emotions throughout the country running high, and with it being well known that the Creighton family has soldiers on both sides of the war, Jethro seems unable to find acceptance anywhere. Danger, murder, vandalism - their family is targeted by hotheads on both sides of the issues. During the five years of the War, Jethro grows from boyhood to manhood. 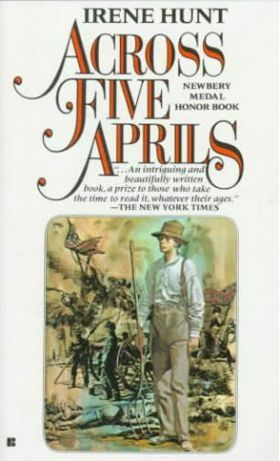 "Across Five Aprils," by Irene Hunt, won 4 different awards, including a Newbery Honor. It makes an excellent addition to any study of American history and the Civil War. A Progeny Press Study Guide is available for this book. I read this book aloud to my children as we studied the Civil War era. I would say that I learned more about the Civil War from this one book than I ever did in public school. In school I remember the Civil War was about slavery and the south was bad, so to speak. this book shows the two sides from the very interesting vantage point of a young boy who has brother's fighting for both sides. The North was not entirely virtuous & the South was not just promoting slavery! I would recommend this to any family studying the civil war. Even my 6 year old and 3 year old sat quietly while I read it and would join in requesting another chapter with their other siblings when I stopped (or sometimes paused for a breath!) :) Highly recommended!! !